Now is the time to choose and order your bulbs in time for planting in November. 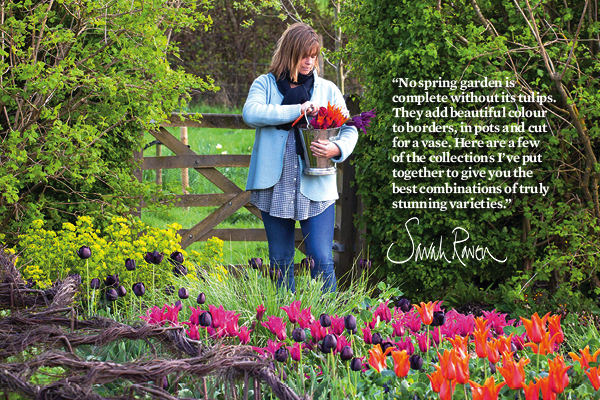 Sarah Raven has put together three stunning tulip collections to make choosing even easier. “No spring garden is complete without its tulips. They add beautiful colour to borders, in pots and cut for a vase. Here are a few of the collections I’ve put together to give you the best combinations of truly stunning varieties.” Sarah Raven. 1.Venetian Tulip Collection. Quote offer code TSTSEPT13 for free P&P. This is one of the best ever tulip collections we’ve had planted together in the garden and in pots. Magnificent! The collection includes Tulips ‘Couleur Cardinal’, ‘Havran’ and ‘Prinses Irene’. Flowers: Mid April-May. 2. Best Dark Tulips Collection. Quote offer code TSTSEPT13 for free P&P. Who can resist this luscious mix of tulips in a lovely array of purple, crimson, deep red and black? Collection includes Tulips ‘Black Parrot’, ‘Muriel’, ‘Havran’ and ‘Ronaldo’. Flowers: Mid April-May. 3. Jewel Tulip Collection . Quote offer code TSTSEPT13 for free P&P. I’m obsessed with coppery brown and burnt-orange tulips, particularly when mixed with crimsons and blacks. That’s exactly what you’ve got with this collection. Includes Tulips ‘Annie Schilder’, ‘Black Parrot’, ‘Bruine Wimpel’, ‘Burgundy’ and ‘Cairo’. (Euphorbia, pictured, also available from www.sarahraven.com.) Flowers: Mid April-May. Visit www.sarahraven.com and quote offer code TSTSEPT13 on your shopping basket page or call 0845 092 0283 and quote offer code TSTSEPT13. * Offer valid on these tulips and other products from the autumn range, available on www.sarahraven.com. Offer valid until 31st October 2013. Offer cannot be used in conjunction with any other offer or discount, and previous purchases are not valid.